[Anglican Communion News Service] The Archbishop of Canterbury has spoken of his “profound sense of shame” over church-based abuse of children and vulnerable adults. 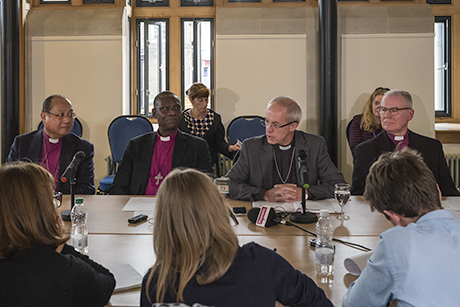 Archbishop Justin Welby made the comments at a press briefing during the Primates Meeting in Canterbury Cathedral. He had been asked about planned visits to Canterbury by groups of survivors on Friday, who want to ensure that their concerns are heard by the church leaders gathered for the meeting. Welby said that the “extent of the legacy of abuse” was “one of the surprises” he faced when he became archbishop in 2013. “I feel that the church – and it is widely accepted within the church – that we have a long history of significant failure,” he said. “We should be held to a higher standard because we are Christians. We are a church. He explained that he spoke regularly with the primate of Australia, Archbishop Philip Freier, about that church’s response to safeguarding, saying that “the Australian Church has done a lot of work on this.” A royal commission – a formal public inquiry – has recently been held in Australia to investigate institutional responses to child abuse. A statutory public inquiry – the Independent Inquiry into Child Sexual Abuse – is currently undertaking a similar investigation in England and Wales. Welby said that “in response to discussions with survivors and seeing the need for it,” he had written to the British Home secretary – the current Prime Minister Theresa May – before IICSA was announced to call for a public inquiry and to urge “that the Church of England should be one of the first” organizations to be investigated. Together, the Church of England and the Church in Wales, form “the Anglican Church strand” of the IICSA inquiry. Hearings in the Anglican strand are expected to begin early next year. A preliminary hearing is taking place Oct. 4 in London. On its website, IICSA say: “the inquiry welcomed the invitation of the Archbishop of Canterbury for the inquiry to investigate, as a matter of priority, the sexual abuse of children within the Church. Allegations of child sexual abuse within the Church of England, the Church in Wales and other Anglican churches operating in England and Wales (‘the Anglican Church’) are matters of ongoing public concern. “This investigation will assess the appropriateness of safeguarding and child protection policies and practices in the Anglican Church. It will consider the adequacy of the past cases review of the Church of England and the historic cases review of the Church in Wales.